Attention deficit hyperactivity disorder (ADHD) is a condition characterized by inattention and/or disinhibition (impulsivity or hyperactivity). Everyone experiences SOME of the symptoms described above from time to time. However, for someone with ADHD, the symptoms have been present since childhood and have caused significant problems in school, work, relationships, or other aspects of a person’s day-to-day functions. People with ADHD may be mistakenly identified as “lazy” or “stupid,” when their brains are really just wired a little differently. ADHD is often associated with depression, anxiety, mood swings, substance abuse, or low self-esteem. Symptoms of ADHD may be mild to severe, and can vary with the situation. ADHD is a developmental disorder which has been present since a person was a child. While it may not be diagnosed until someone is an adult, there is no such thing as “adult-onset ADHD.” When someone develops NEW problems with attention or hyperactivity as an adult, there is most likely some other cause, like poor sleep, substance abuse, illness, or a history of brain injury. ADHD tends to run in families and genetics are believed to be a factor. There is some evidence that medical complications or behaviors such as smoking or drinking during pregnancy is linked to ADHD in children. Babies with low birth weight may, children with a history of traumatic brain injury, and children exposed to environmental toxins early in life may also have a higher risk of ADHD. In America, between 2% and 5% of children are affected by ADHD. Males are 4 to 5 times more likely to be diagnosed with ADHD than females. 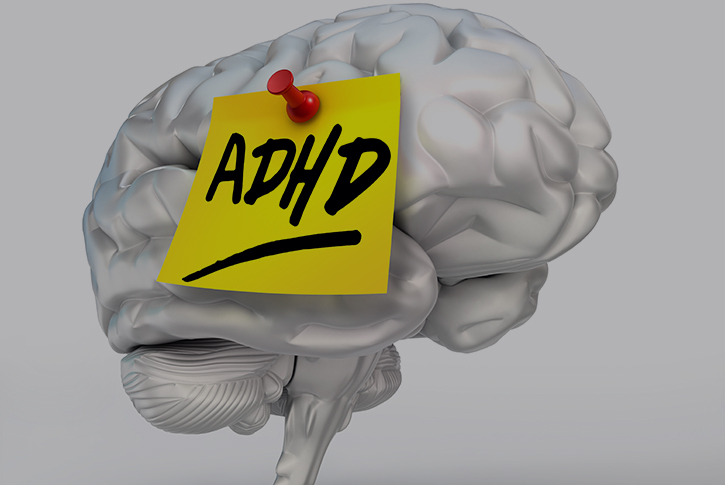 Research suggests that ADHD is more common in athletes than in the general population. One study found the highest rate of ADHD in athletes was in in football players (17.5%). It used to be believed that kids “grew out” of ADHD when they got older, but that is not the case. Some people develop strategies for managing their symptoms or find roles in which their symptoms are an asset rather than a drawback. For professional football players, their lives are so highly structured that their symptoms may not have a chance to manifest themselves. When players retire, the lack of structure can present real challenges for someone with ADHD. There are no published studies on ADHD in retired football players. Only a qualified health professional should diagnose ADHD. Diagnosing an adult with ADHD requires taking a careful patient history, and collecting information from someone who knew the person as a child is helpful. Symptom checklists are often used but not required. Neuropsychological testing can help rule out other causes of problems with attention or memory but is not required to make the diagnosis. Medications are often used to treat ADHD, and about 2/3 of adults who are treated with medication show significant improvement in their ADHD symptoms. However, there are medical reasons some people should not be treated with stimulants, and someone with a history of substance abuse should be particularly careful about their use. Medications for ADHD require regular doctor’s visits. Counseling/Individual therapy can help someone with ADHD understand their strengths as well as their weaknesses and teach them strategies for dealing with anxiety and stress. ADHD coaches specialize in helping people get and stay organized and develop compensatory strategies to limit the impact of their ADHD no their day-to-day functioning. Exercise is an important way for many people to manage their restlessness. Physical activities that require sustained attention, like yoga or tai chi, are also helpful. Mindfulness meditation is a way to “train your brain” to slow dow. Like any skill, it requires practice, and may be particularly hard for someone with ADHD to learn, but it has been shown to improve attention, focus, and memory. The first step toward getting help is to be evaluated by a doctor or other mental health your primary care physician may be able to recommend someone, or The Trust can help you find someone in your area. The Trust has made arrangements with Cigna to ensure that ALL retired professional football players, whether they have insurance or not, can have up to 6 counseling sessions free of charge. Escalona, , Esfandiari, A., Broshek, D. K., Freeman, J. R., (2011). Counseling athletes within the context of neurocognitive concerns. In F. M. Webbe (Ed. ), The handbook of sport neuropsychology (pp. 235-249). New York, NY: Springer Publishing Company, LLC. Williams, , & Penman, D. (2011). Mindfulness: An 8 week plan for finding peace in a frantic world. New York, NY: Rodale, Inc.